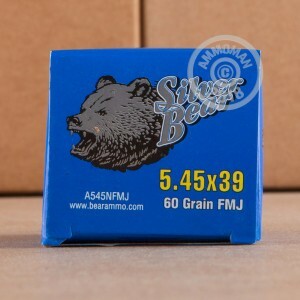 Treat your AK-74 or other 5.45x39mm rifle to Silver Bear ammo from the Barnaul Machine Plant in Russia. 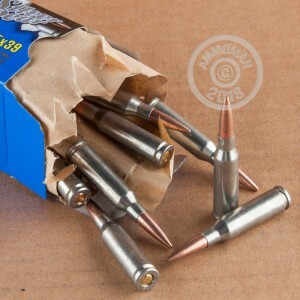 These steel-cased cartridges maintain the low price and reliable ignition of their milsurp cousins, but use non-corrosive Berdan primers and a zinc case coating that provides better feeding and shelf life. Each round in this box of 30 fires a 60 grain bimetal jacketed bullet. Stock up on this affordable ammunition at AmmoMan.com and enjoy free shipping on all orders over $99.